Monocrystalline Ni-Mn-Ga magnetic shape memory alloys with compositions near the Ni2MnGa Heusler phase exhibit large reversible magnetic field induced strains (MFIS) at room temperature mediated by twin boundary motion, making them suitable for applications including actuators, micro pumps, energy harvesting devices, and magnetic refrigerators. However, in polycrystalline Ni-Mn-Ga, the incompatibilities between neighboring twinning grains results in a negligible MFIS. 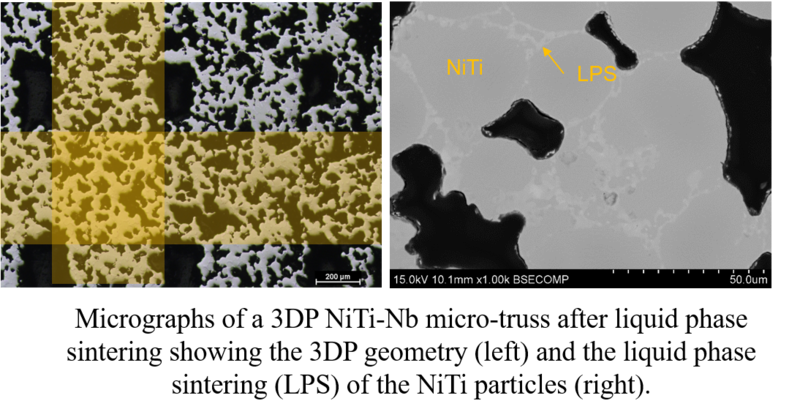 The introduction of porosity between the grains alleviates the twinning mismatch and greatly enhances the MFIS of polycrystalline Ni-Mn-Ga. Shape memory and superelastic NiTi micro-truss structures are attractive for biomedical applications such as actuators and bone replacements because of their unique combination of low density and stiffness and high surface area, biocompatibility, compressive strength, and ductility. In both systems, the ability to create micro-lattices with controlled porosity is essential to achieve the desired shape memory properties. In collaboration with the Shah lab at NU, we are developing a new additive manufacturing method that combines extrusion-based 3D-printing and sintering heat-treatments to create Ni-Mn-Ga magnetic shape-memory alloy (SMA) and NiTi-Nb SMA wires or micro-lattices. 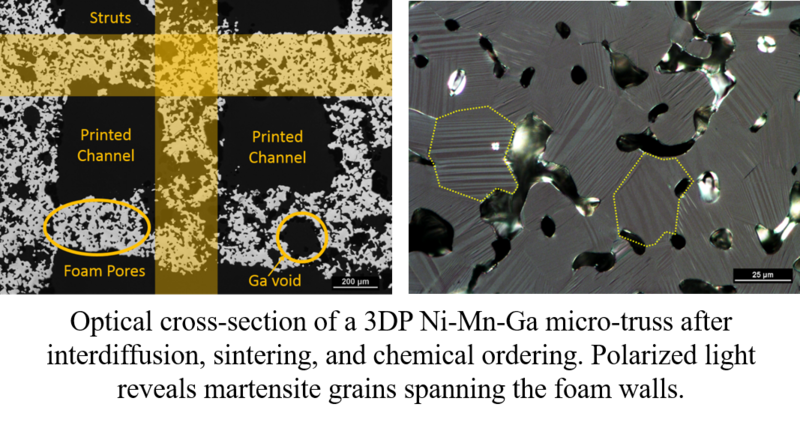 After (i) 3D-printing of a particle-based ink containing elemental or partially pre-alloyed Ni, Mn, and Ga powders, (ii) interdiffusion and homogenization to create the final alloy, and (iii) further sintering, controlled amounts of porosity are achieved in the Ni-Mn-Ga struts, which are beneficial to their twinning ability. Similarly, (i) 3D-printing of inks containing NiTi and Nb powders and (ii) liquid phase sintering via the formation of a NiTi-Nb eutectic, results in NiTi micro-lattices with struts containing some NiTi-Nb eutectic phase and residual porosity. We are investigating the effects of the 3D-printing parameters and heat-treatment duration and temperature on the microstructure, porosity, and shape memory properties of the Ni-Mn-Ga and NiTi-Nb wires and micro-lattices, using a combination of ex situ metallography, in situ X-ray tomography, and finite-element modeling. Jakus, A. E., Taylor, S. L., Geisendorfer, N. R., Dunand, D. C., & Shah, R. N. (2015). Metallic architectures from 3D-printed powder-based liquid inks. Advanced Functional Materials, 25(45), 6985-6995. Jakus, A. E., Taylor, S. L., Geisendorfer, N. R., Dunand, D. C., & Shah, R. N. (2015). Metallic Printing: Metallic Architectures from 3D-Printed Powder-Based Liquid Inks (Adv. Funct. Mater. 45/2015). Advanced Functional Materials, 25(45), 7099-7099. Boonyongmaneerat, Y., et al., "Increasing magnetoplasticity in polycrystalline Ni-Mn-Ga by reducing internal constraints through porosity", Physical Review Letters, 2007. 99(24). Chmielus, M., et al., "Giant magnetic-field-induced strains in polycrystalline Ni-Mn-Ga foams", Nature Materials, 2009. 8(11): p. 863-866. Dunand, D. C., & Müllner, P. (2011). Size Effects on Magnetic Actuation in Ni-Mn-Ga Shape-Memory Alloys. Advanced Materials, 23(2), 216-232. Effect of pore architecture on magnetic-field-induced strain in polycrystalline Ni-Mn-Ga, X. Zhang, C. Witherspoon, P. Mullner, D.C. Dunand, Acta Materialia 59 (2011) 2229-2239.